TNT 35 is a Test Monitoring Unit for the periodic testing of “testable” opto-electronic protective devices. Both components, sensor and TNT 35, form an AOPD in accordance with IEC/EN 61496-1, -2. Up to 6 type 2 sensors can be connected to the TNT 35 via a series connection. In addition to testable Leuze electronic type 2 Single Light Beam Safety Devices, type 2 Single Light Beam Safety Devices of the MLD 300 series can also be connected. The machine’s functional sequence remains unimpaired by the periodic internal function tests. 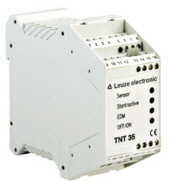 Purchase your Leuze TNT 35 Configurable Safety Relays today!